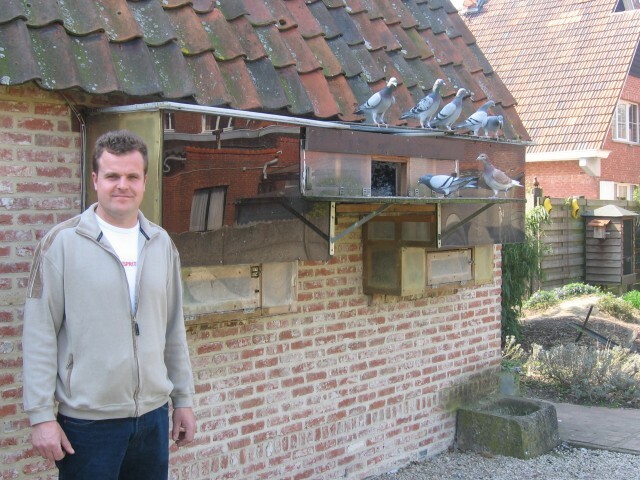 *Pulle, Belgium – For a few years now, Danny has been at the top in the middle-distance races with his ‘Kanon’ family, especially with the young pigeons, and he has already been 1st, 2nd and 3rd National Champion. In 2013, he decided to enter his best yearlings in more races. The loft was converted and made ready for 10 couples on total widowhood. In the eyes of many, this year Danny is one of the best Antwerp middle-distance racers, with an exceptionally high prize percentage! Which means in 10 races a total of 144 yearlings basketed… 115 prizes (or 79,9%) and 68 per ten (47,2%). Among all of this yearling-power there is one old pigeon, the ‘Harley’ or 2nd Ace pigeon yearlings Union-ZAV 2012, who in 2013 among others prizes won 2nd Dourdan against 817 old pigeons… 6th Dourdan against 1,734 old pigeons… 23rd Dourdan against 2,381 old ones… 38th Melun against 769 old pigeons, and 39th Dourdan against 542 old pigeons, and with this he has now won 20 prizes in 20 races with 15x per ten percent in two years. But the young pigeons of 2013 are already doing extremely well also, succession therefore seems to be assured, and the places in the team for next year are likely to come at a high price !